After three weeks of continuous operation, the Donation Depot is now closed. It grew out of a need to respond to the flood that covered North Bend March 15 and the flood of donations that followed. The North Bend Fire Department was forced out of its station by the flood waters and moved to the high school to set up a recovery headquarters. And the donations started to come in. A few were ok. But when more started to come in, the fire personnel knew they needed help. 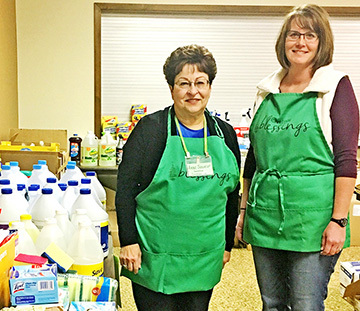 Anne Soukup and Wendi Emanuel organized and ran the Donation Depot for its 21 days of operation. Kragh Johnson was a third member of the organization team, but all volunteers were equally appreciated. Wendi Emanuel’s name was brought up. Emanuel had experience setting up the Blessings Store the last few Christmases. Emanuel went down to NBC to evaluate things on Sunday, March 17, and soon realized she needed help. Anne Soukup was suggested. When Emanuel called her, Soukup didn’t hesitate. The two women got together at noon on Sunday, two days after the flood began, and set up the old NBC gym. Emanuel made signs to place items logically around the gym. That night, the two women called friends to help man the donations coming in and going out. They wore green aprons from the Blessings event to standout. The numbers of volunteers varied, maxing out on Sunday, March 24, with 108 volunteers helping at the Donation Depot. Their initial list included a dozen items that had been donated. Around midday Monday, March 18, donations started to pour in. Soukup agreed with the overwhelming response for those donating and volunteering. Soukup has been at the Depot every day since it opened. Emanuel took off one day to see her family.